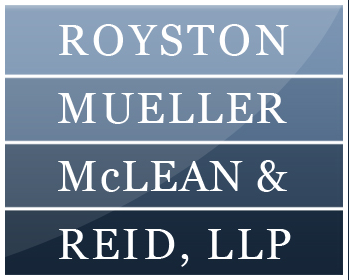 Integrity, experience, and client service for more than 50 years For more than five decades, the law firm of Royston, Mueller, McLean & Reid, LLP has provided legal representation to the people and businesses of the Baltimore Metropolitan Area and surrounding jurisdictions. Our attorneys, individually and collectively, take pride in providing sound legal advice and service to answer the needs of each client in a timely and efficient manner. Sophisticated legal solutions throughout the mid-Atlantic states Our top-rated attorneys work to find the most effective and efficient solutions to your legal problems in the areas of practice that matter most to you, including -Litigation -Trusts and Estates -Family and Divorce Law -Real Estate -Criminal Law -Commercial Transactions -Alcohol and Beverage Licensing -Business and Tax Matters -Commercial Lending -Land Use and Local Government The sophistication of our practice allows us to address the growing needs of businesses and individuals in our community without sacrificing the personal touch that our clients have valued for more than 50 years. Buying, selling or leasing real estate is often the largest transaction a person or business ever makes. The advice of an experienced real estate attorney can help you negotiate the best possible deal for your real estate transaction. Documenting all aspects of the deal, from the offer to the closing, is also essential to the successful accomplishment of the parties' goals. Royston, Mueller, McLean & Reid, LLP offers a full range of real estate services, including -Drafting offers and counteroffers -Obtaining financing -Preparing closing documents -Issuing title insurance -Advising buyers, sellers, landlords, and tenants -Satisfying contingencies -Attending closings Our experience has earned us the confidence of our many local, regional, and national clients in fulfilling these transactional needs. 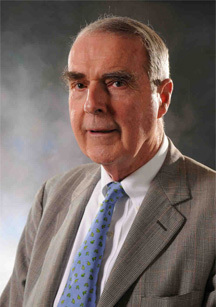 After graduating from the University of Virginia Law School in 1953, Taylor McLean served as an Assistant United States Attorney for the District of Maryland in Baltimore. He came to Towson to practice with the firm (then, Proctor, Royston & Mueller) in 1960. He currently has an active estate administration and estate planning practice.